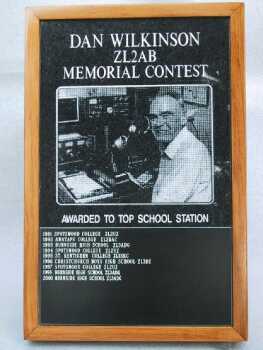 Dan Wilkinson was the original holder the ZL2AB club callsign. Certificates for 1st, 2nd & 3rd place will be awarded to both Taranaki and non-Taranaki stations who collect the most points. The Dan Wilkinson Memorial Stone Trophy will be engraved with the name and callsign of the Taranaki station with the highest number of points. However because of the sheer size and weight of the trophy it will remain the clubrooms. 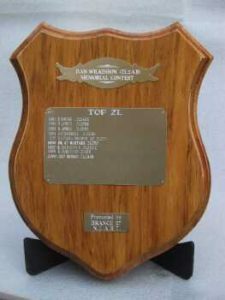 The Wooden Trophy will be awarded to the non-Taranaki station with the highest number of points. The Trophy must be returned in time for following years Award/Contest.